There are so many ways to work out choreography. Sometimes I listen to the music and visualise the dance. Sometimes I count out beats. I use the lyrics to suggest motions. Today I have spread out all of my dance movement cards and sorted through my hoop trick cards to create the foundation of a dance. I like doing this because it ensures that I don’t repeat myself too much. You know how easy it is to fall back on the dozen moves you love most. While repetition feels great during practice, it’s not meant for an audience. It’s not so interesting to see the vortex again and again…and again. 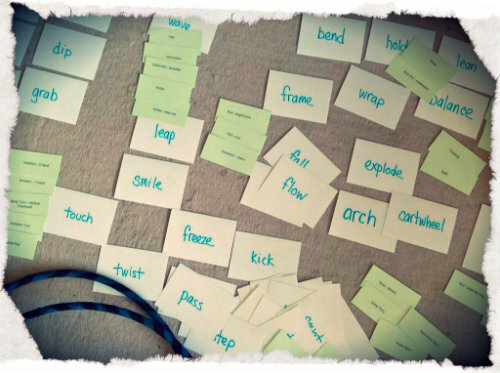 With cards on the floor, I find it easy to move things around, add and subtract ideas, and rearrange the structure for a better fit with the music. When I start dancing, I can peek at the cards to see if I have got all the bits I wanted. Sometimes I add more. I even hand-write new cards if I discover a missing trick or add some new movement concept. The dance pictured is about a relationship: meeting, wooing, winning, arguing, leaving. The choreography fits the music, but the exact details aren’t decided yet. Cartwheel? In my dreams. Perhaps not in this dance. This choreo will be my entry for the Japan Hoopdance Championship. Video entries are due by the end of the month and the contest is open to all hoopers who live in Japan (and are available to perform on October 19th, 2013 if they win). There are categories for solo, group and children. This is an unprecedented contest in Japan; please consider making an entry!